Video clip synopsis – A tiny, war-ravaged liferaft from the HMAS Sydney is our only physical link to Australia’s worst-ever naval disaster. Broadband MP4 hmassydn_bb.mp4 (17.4MB), suitable for iPods and computer downloads. 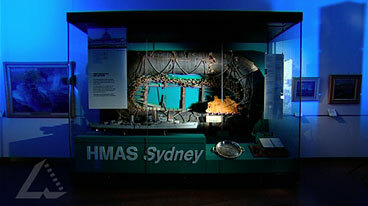 HMAS Sydney’s Carley Float is an episode of the series National Treasures produced in 2004. One of the most poignant objects in the Australian War Memorial is the battered survivor of our worst-ever naval disaster. What happened to this liferaft and why is it so special? Warren Brown talks to curator John White about this tiny, war-ravaged float from HMAS Sydney whose entire crew of 645 was lost when the ship sank after a mysterious battle off the West Australian coast in 1941. 5.10	demonstrates how art criticism and art history construct meanings. On 19 November 1941 the Australian light cruiser HMAS Sydney was travelling in the Indian Ocean from Sumatra to Fremantle. When it was west of Shark Bay, it saw and challenged a ship. The ship claimed it was a neutral merchant vessel, but was in fact a disguised German warship, Kormoran. The Sydney came close to investigate, and was surprised when the Kormoran opened fire. Both ships were sunk, but while there were survivors from the Kormoran, all 645 crew members of the Sydney died — making it Australia’s worst ever naval disaster. One body believed to be that of a crew member was washed up on Christmas Island (and knowledge of the location of his grave later lost). The only physical trace of the Sydney ever recovered was one of her Carley Floats, a form of life raft. The government kept the disastrous incident quiet for as long as it could, but rumours soon spread, and it had to break the terrible news. The rumours led to many wild stories at the time, and have been partly responsible for many conspiracy theories since — such as that a Japanese submarine had sunk the Sydney two months before Japan entered the war. Several books have been written about the mystery, and a Commonwealth parliamentary inquiry reported on it in 1999. The discovery of the Sydney wreck was announced on 17 March 2008 following the discovery of Kormoran’s wreckage one day earlier. What was the HMAS Sydney? Why was that such a tragedy? Why might the Carley Float have survived the engagement? Why might it have been the only relic from the ship ever found? One common form of art is a memorial. In Australia, the most common form of memorial is the war memorial. What is the purpose of war memorials? What is the main message of this memorial? Do you think it is a good piece of art? Explain your reasons. Select another public memorial, and analyse its elements in a similar way to that above, through the subjective, cultural and structural frames.